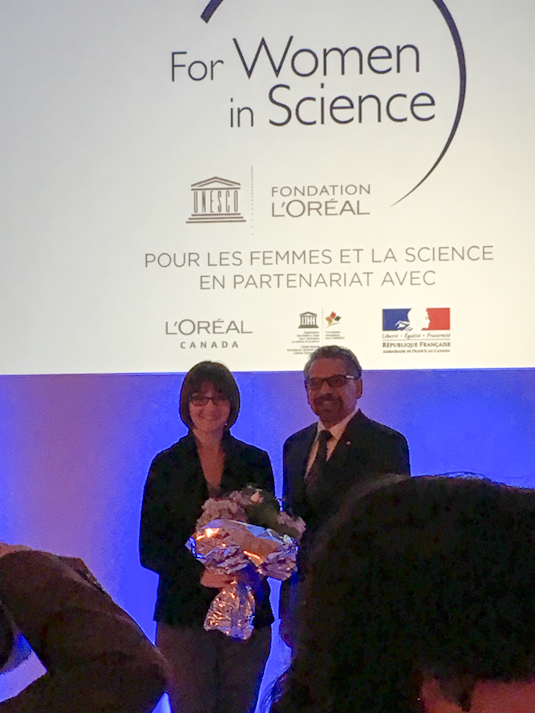 On January 19th, 2016, Michelle Annett was presented with the L’Oreal-UNESCO for Women in Science-NSERC Postdoctoral Fellowship Supplement Award. UNESCO and L’Oreal invited the top 3% of female post-docs that have received an NSERC PDF Award to apply for this award, and from those applicants Michelle was selected as the single winner. The award was presented to her personally by Mario Pinto, president of NSERC. The Canadian minister of science, Kirsty Duncan, also read over Michelle’s biography and offered her congratulations. The event took place at the French embassy in Ottawa. Both before and after the award ceremony, Michelle had the opportunity to talk with many members of the embassy, NSERC, and other high-level academics across Canada (e.g., the presidents of the University of Ottawa, the University of Calgary). There were nearly 200 attendees, whom she had a chance to speak with about her research, Autodesk Research, U of T, U of A, and the importance of computer science in general. This was not only a great experience for Michelle, but it let her shed a positive light on Autodesk, U of T, U of A, and HCI research at a national and international level. “As an animator, I’m trying to animate realistically,” says Chris Landreth, Academy Award® winning animator and filmmaker – and now distinguished research artist-in-residence in the University of Toronto’s department of computer science. Read the full article at http://news.utoronto.ca/oscar-winning-animator-and-filmmaker-chris-landreth-u-t-computer-science. The Department of Computer Science, Faculty of Arts & Science and Faculty of Medicine are pleased to announce and invite the U of T community to a special lecture by Chris Landreth, a Distinguished Research Artist. The lecture will take place on Wednesday, January 27 at the Bahen Centre for Information Technology, 40 St. George Street, Room 5166 4:15 to 5:15 PM, there will be a Q&A 5:15 – 6:30 PM. RSVP for the event at http://web.cs.toronto.edu/news/landrethlecture.htm.